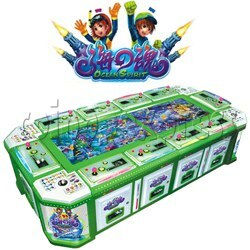 Ocean Spirit Medal Game is a giant fish catcher medal machine, with two 47 inch LCD screens offers large scale playfield for 10 players, based with 5 various shooting weapons to catch fish, more than 22 different fishes, plays fun with shooting fish game, super fortune roulette JACKPOT game, and exciting fish racing for champion game. Players can change different weapons shot fishes to win bonus or collect precious stone, such as change from super cannon to more powerful terminator cannon, this fish game becomes to be an exciting shooting game. When player collects over 5 precious stone, it will get chance to play fortune roulette JACKPOT game to win 300~800 scores for bonus or lucky chance to win super JACKPOT bonus. According to the set time, it will enter the exciting fish racing for champion game, player guesses the champion to get more reward. The game play is more exciting and skill test with shooting special turtles with rotated rings, player try to shoot the turtles exactly through the ring, it will win more expectable bonus from the turtles. If not, the scores of turtles will be increased.